Hey there! I'm sorry I haven't posted in a bit -- things have been totally crazy these past five or six days (in a good way though). I have some exciting things lined up for this week but I thought I'd begin by showing you guys the nails that I wore on Easter. This design was created by the darling Mr. Candiipants. She has a YouTube tutorial for it that I'd recommend watching if you want to give it a try. It's super easy to do and all you need are the brushes that come with the polish! I chose to use a different color scheme for my version than the one in her tutorial. I used five Zoya polishes in total: Jacqueline (bone white base), Audrina (pink), Malia (purple), Arizona (orange), and Robyn (blue). I used black for the dots in the center of my flowers to try to anchor the bright colors a bit. 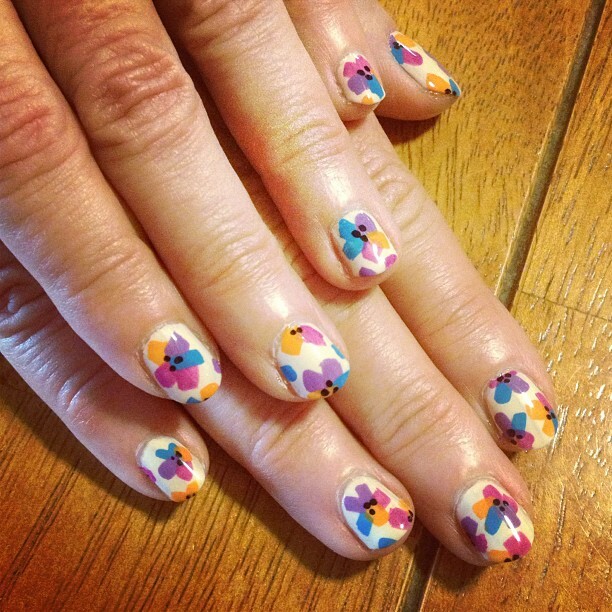 My aunt Cris loved this design so much that she had me recreate it on her nails at Easter! This floral technique is really so easy and quick that I imagine I will be doing it a lot going forward. So thank you to Candice for the fantastic design, and I will see you guys back here tomorrow with another post! Fantastic! 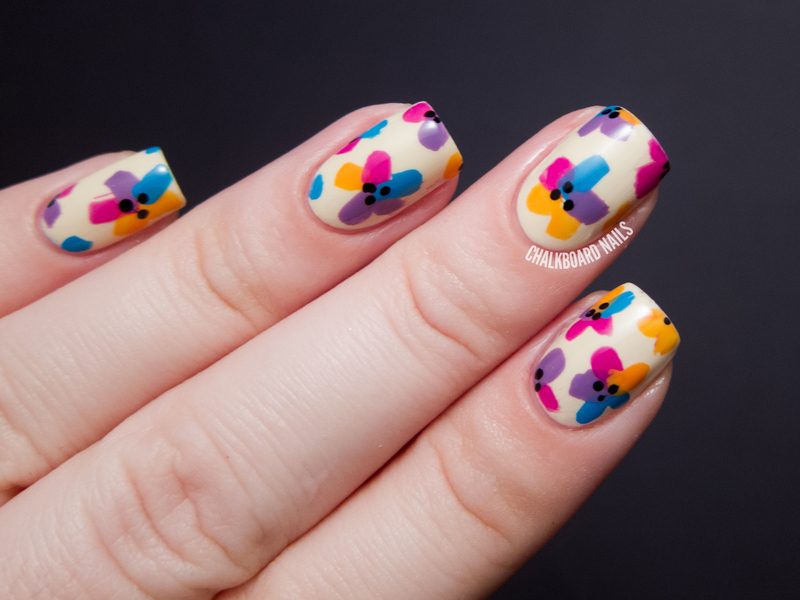 I love the colors you chose together :) I might have to recreate this, too, since it's 'floral week' on my blog right now!! This is so stinkin' cute! I love them! Beautiful, especially with your color choices! I love doing my nails with this design. I love Mr. Candiipants florals too! So much that I recently did one myself. So bright and perfect for spring!! I love this ! The bright colours are great, wish I had access to Zoya polishes ! I might just have to copy this...LOVELY! Seriously??? How in the.... OMG! I saw these on Instagram, and I had to try it myself. They are so easy, and the colors you chose are amazing. Love this! The color combination is great. 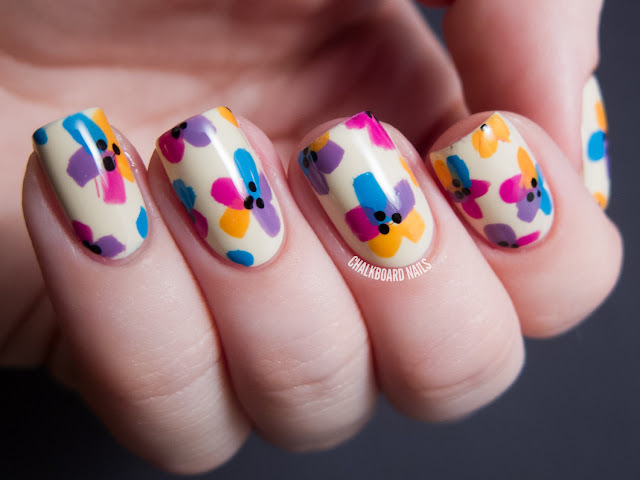 Very pretty mani and neat design. Haha, twinsies! I did something like this last week, but yours are totally different colors :) very cute! Absolutely gorgeous. The colours and design go so well together. I was wondering I am having trouble finding a decent white polish for bases, do you have any recommendations. Does this Zoya one go on fairly smoothly? Well, Zoya Jacqueline is more of an off-white/cream color instead of a true white, and besides that it actually usually requires between 2-3 coats for opacity. I would recommend checking out Milani White On the Spot, Cult Nails Tempest, or OPI Alpine Snow (this one being the least opaque, but still useable). I know that there are tones of us, who have beauty/nailpolish blogs, but u are on the top to me! perfect hands, amazing tutorials, everything is amazing! so excited when i see u posted something new. The flowers are so bold and bright, love them!